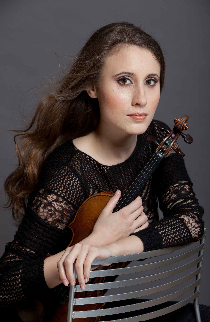 Jennifer Pike, violin, first came to prominence in 2002 after her performance of Mendelssohn’s Violin Concerto in the Barbican with the BBC Symphony Orchestra under Sir Andrew Davis, winning the title of BBC Young Musician of the Year at the age of 12. Acclaimed for her “dazzling interpretative flair and exemplary technique” (Classic FM), she became a BBC New Generation Artist in 2008 and was presented with the first international London Music Masters Award. Jennifer made her BBC Proms début in the Royal Albert Hall at the age of 15 and gave her Wigmore Hall début recital the same year. In recent seasons she has appeared as soloist with orchestras such as the BBC Symphony, Brussels Philharmonic, City of Birmingham Symphony, London Philharmonic, Nagoya Philharmonic, Orchestre Philharmonique de Strasbourg and Vienna Symphony. Current engagements include performances of the Beethoven and Bruch concertos with the Philharmonia Orchestra, the Sibelius concerto with the Bergen Philharmonic and appearances with the Bournemouth Symphony, Hallé and Royal Liverpool Philharmonic Orchestras. She also makes her début with the Iceland Symphony Orchestra performing Haflidi Hallgrimsson’s Violin Concerto, a work composed especially for her, having given its world première with the Scottish Chamber Orchestra in 2011. Her recordings for Chandos include the Debussy, Ravel and Franck sonatas with pianist Martin Roscoe and Rózsa’s “Violin Concerto” with the BBC Philharmonic and Rumon Gamba; forthcoming releases on Chandos feature Chausson’s “Concert for Violin”, “Piano and String Quartet” and sonatas by Brahms and Schumann. She has also recorded the première of Andrew Schultz’s Violin Concerto with the Tasmanian Symphony Orchestra on ABC Classics. At the age of 16 Jennifer was awarded a postgraduate scholarship to study at the Guildhall School of Music and Drama, subsequently continuing her studies at Oxford University where she graduated with First Class Honours. She plays a 1708 Matteo Goffriller violin made available by the Stradivari Trust.